Cacao farmer-turned-businessman Baharuddin Iskandar has found a way to address sluggish demand for homegrown cacao in North Luwu, South Sulawesi. As cacao plantations play a significant role in the local economy, the farmers of North Luwu are worried about the weakening price of dried cacao beans. 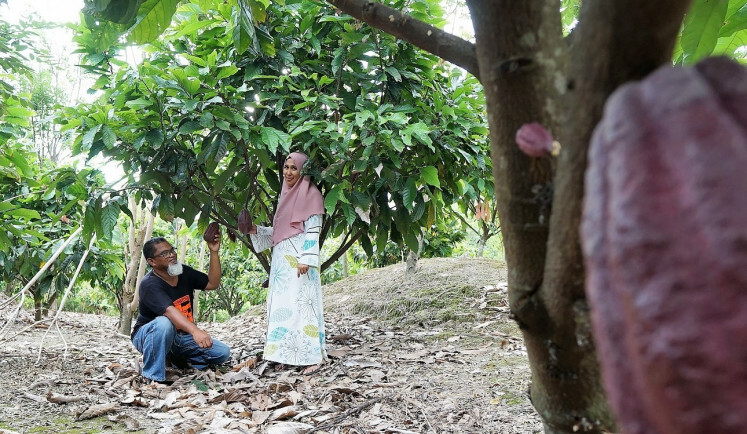 A seasoned cacao farmer, Baharuddin, who is better known as Haji Rudi, is giving fellow farmers hope by offering them a higher price for their cacao beans and turning them into delectable treats. 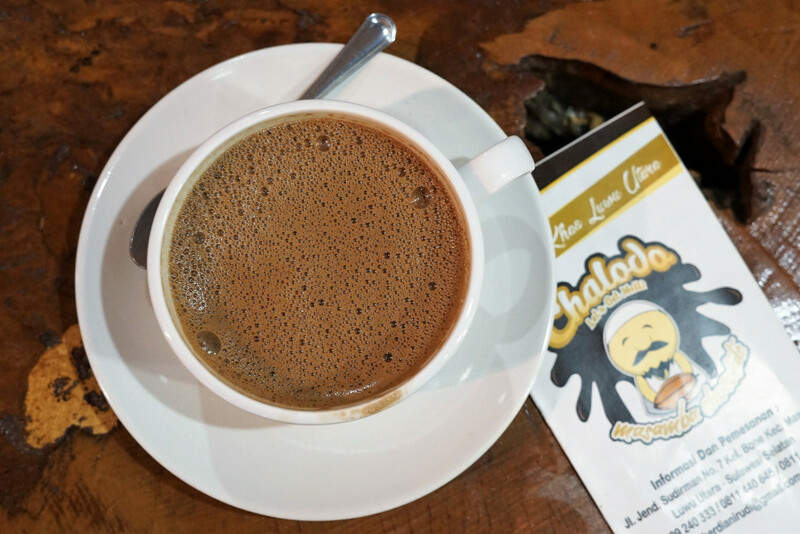 Rudi was all smiles as he savored a cup of chocolate with his wife Erna and their eldest child Ani at his cafe, Kampoeng Cokelat Chalodo, in Masamba, a small town by a river in North Luwu. “Ani was born when we were growing cacao trees in Salulemo, a long way from Masamba,” said Rudi, who started planting cacao in the late 1980s. The Salulemo plantation was his first cacao estate after marrying Erna. He originally collected rattan from the area, before cultivating corn and cacao there. From their small cacao plantation in Salulemo, Haji Rudi and Erna built their chocolate business. Their extensive estate in Masamba comprises of the chocolate-themed cafe, a chocolate factory and a plantation. Rudi’s family lives in a stilted wooden house in one corner of the estate. Next to his house, Rudi parks his luxury SUV – a rare type of car on the streets of Masamba. From the 700 cacao trees on his Masamba plantation, Rudi can harvest as much as 2 tons of wet cacao beans per month. His factory produces between 50 and 100 kilograms of chocolate bars and powder daily. 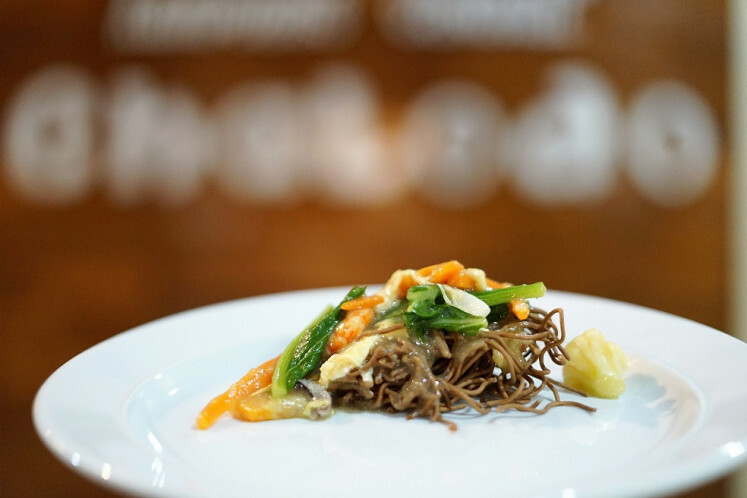 In addition to that, Rudi and Erna have also developed chocolate noodles. Rudi promises that his sweet treats will not harm one’s teeth. “I don’t want to hear the toothache myth anymore when children consume chocolate. The ache is actually caused by particular ingredients in the chocolate mixture. We use safe ingredients for our blends,” he claimed. The couple plans to extend the business by opening two chocolate stores in the South Sulawesi capital of Makassar. Rudi’s is a rare success story in South Sulawesi’s cacao industry. While he can live comfortably from selling a variety of chocolate products, many fellow farmers in the region are still pinning their hopes on selling dried cacao beans – and more often than not, the price is just not good enough. In the local market, dried cacao beans are sold at Rp 27,000 (US$1.90) to Rp 30,000 per kg, said Ismail Lendre, the chairman of the Salotok Village Economy Institute in North Luwu. “The price was once Rp 37,000, but only for a while,” Ismail added. Rudy leaped from being a farmer to a chocolate businessman after receiving a cocoa processing machine from the provincial administration in 2008. The machine can produce 5 kg of cocoa powder and butter per week. Rudi has spent Rp 300 million to improve the machine’s production capacity. “The money was spent on supporting equipment as well as for upgrading the factory and warehouse,” he said. Rudi had to subsidize his factory for almost four consecutive years to cover labor and electricity costs. Luckily, he also owns a haj travel firm, which helped support his chocolate factory. With additional support from the government, Rudi reached a daily production capacity of 30 kg in 2012. Now that he has established his chocolate business, Rudi wants to share his success with fellow farmers. “Though we’re small, I want cacao farmers […] to earn profits as well. From farmers, I buy dried cacao beans at Rp 40,000 per kg at least, up to Rp 50,000 if the quality is good. But as my factory’s capacity is limited, I dare not buy in large quantities,” he said. 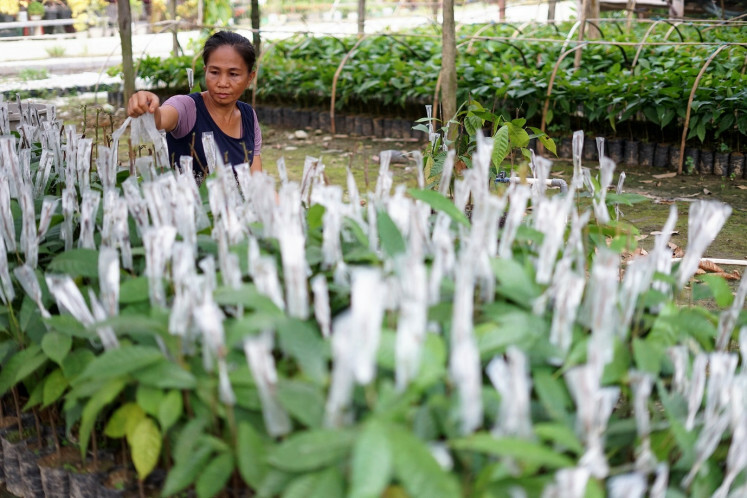 North Luwu Regent Indah Putri Indriani said her administration was striving to boost cacao production and improve farmers’ income through its Cacao Center. As of 2017, North Luwu has 39,400 hectares of cacao plantations producing a total of 26,300 tons of wet cacao. The regency plans to open another 11,000 ha of land for cacao plantations. It is also promoting the use of North Luwu’s leading cacao clones of MCC-01 and MCC-02. Farmers are encouraged to take part in a chocolate certification program that will help them secure a higher selling price and an incentive – called premium payment. Ismail of the Salotok Village Economy Institute, however, said the regency’s program was not enough to solve the farmers’ problems. Many Masamba cacao farmers have been certified but have not received the promised premium payment. “For almost two years now, the premium has not been paid,” he said. Ismail suggested that the central government interfere in the market with purchases to give farmers a high selling price.